t*rexes and tiaras: Tuesday Titles 065.. 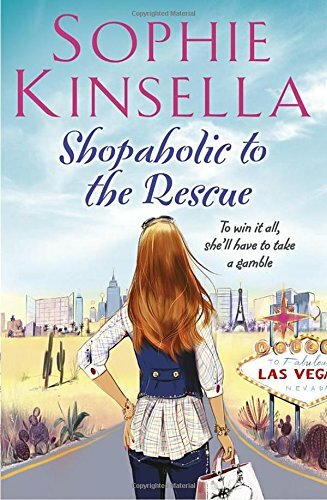 It's been quite a while since the last book I read in the Shopaholic series, which meant that I was quite excited when I heard there was to be a new one released (this Thursday in fact!). I got stuck straight in, even more intrigued when I found out that it was set in Las Vegas. Nostalgia from last year's trip has well and truly set in. So, I started out with plenty of enthusiasm...and then remembered how annoying I find Becky Bloomwood as a protagonist. I rolled my eyes inwardly at her idea of becoming a bounty hunter, and how "cute" her business cards would look. The book, as with the others, is peppered with correspondence between Becky and her bank manager, as well as various other bodies and those are quite amusing, at least. The story itself? Well, it's a a kind of wild goose chase, where Becky and family follow Graham and Tarquin to the United States. The plotline became quite predictable, quite early on and it seems a little as though this is just paving the way for another future title. Yes, there are some quite amusing jokes and things, but there's a big part of me which wonders how long this series is going to be strung out. That said, if you're a great fan of the Shopaholic series, that's probably what you're wondering, too. Just in a more hopeful way than me. I know exactly what you mean! Exactly!! I find Becky highly irritating and think how unrealistic her luck is. That said, they are quite entertaining! I know, there's something about these books which have meant that I've read them all, even though I find her super-frustrating!